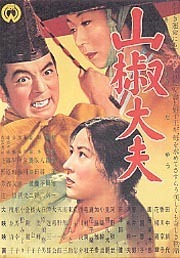 Sansho the Bailiff (Japanese: 山椒大夫Sanshō Dayū) is a 1954 film by Japanese film director Kenji Mizoguchi. Based on a short story of the same name by Mori Ogai, it tells the story of two aristocratic children sold into slavery. It is often considered one of Mizoguchi's finest films, along with Ugetsu and The Life of Oharu. It bears his trademark interest in freedom, poverty and woman's place in society, and features beautiful images and long and complicated shots. The director of photography for this film was Mizoguchi's regular collaborator Kazuo Miyagawa.